We had a bit of a scare tonight. Sophie couldn’t find her two towels. They’d been missing since yesterday. Her towels are her Linus blankets. 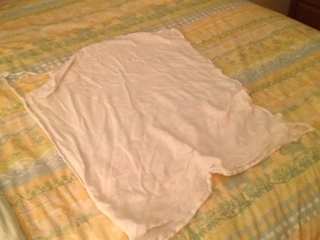 In reality, they are burp cloths that she threw up on when she was just a few days old. The two surviving warrior towels definitely look their age. The cotton has thinned out and the holes are getting bigger by the day. One of them is starting to look like the Shroud of Turin. But Sophie, who turns seven in one week, is not ready to relinquish them. And so when she thought they were lost, she was devastated. holes left in them before calling it quits. Which makes me happy. Because those ratty burp cloths are Sophie’s last remaining connection to her infancy.